I am nearly speechless. It’s rare for me to lose words when it comes to books I love, but Maas has managed to write a book that took the words from me. I’ve been eagerly awaiting Crown of Midnight and it did not let me down at all. I mean…wow. Celaena is now the King’s Champion, doing his bidding by getting rid of his enemies. He tells her a name; she goes to get rid of the “problem.” It’s the bargain she has made for her freedom. She is anything but loyal to the king, though, and that puts not only herself in danger, but those she cares for as well. Chaol is the man she finds herself drawn to, but she values her friendship with Prince Dorian as well. Things only get more complicated when secret plots and long forgotten information start finding their way out. Celaena is a dichotomy. She is fearless, yet cowardly. She’s strong, yet powerless. She’s incredibly brilliant, but confused. She has no problem taking on someone in a fight. She knows how to handle herself there. But when faced with secrets and cover-ups, she cowers. She can fight against the most well trained fighter and win, but she can’t fight against forces she can’t see. When faced with horrible tasks, she figures out a way around them in order to save lives, but lets her emotions cloud her judgment at times. She’s a fascinating character and after the last chapter, I really cannot wait to read more about her. Chaol and Dorian are still wonderful. Dorian has accepted that he may not be her first choice and that creates a bit of tension between the three of them. He still wants to remain friends, but the lines are blurry and need to be sorted out first. Chaol is loyal to the crown and he lets that interfere with what he wants to do. And then trouble hits and the three of them fall apart and roles are changed. It’s amazing how Maas can write a love triangle that’s not really a triangle, but still lets you have those warm, fuzzy feelings about both boys. I love it. The plot. My, oh my. The entire story is a thing of beauty. There are creates and fights and secrets and it’s simply lovely to read. Everything that happens answers one question but leaves you with more. It’s a twisting, winding maze that I can’t see the end of, but can’t help but try to piece together. That I have to wait until next year to get more of the story is leaving my insides curling. 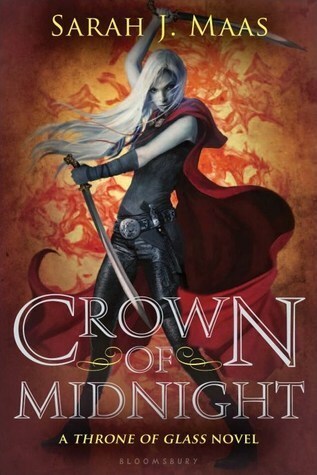 Crown of Midnight is a stunning novel that has me declaring that this is a must read series and author. Maas can write an amazing novel and the wait for the next novel is way, way to long. I need it in my hands as soon as possible. This entry was posted in Something a Little Different, The Must Reads, Young (and New) Adult and tagged Fantasy, Must Read Series, Must-Reads, Sarah J. Maas, Seriously...You Must Read This, Young Adult.